Not to be confused with Peach's Castle Garden. 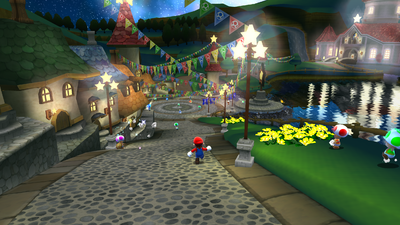 The Castle Gardens is the first playable section of Super Mario Galaxy. It is a large plaza lined with various buildings, lamposts with star-shaped lights and a fountain. The area is also decorated with blue flags depicting stars, which are hung from lampposts, and multicolor banners featuring pictures of Mushrooms, strung from the top of buildings to lampposts to treetops. At the site of the Star Festival, it is located directly outside Princess Peach's Castle. At the beginning of the game in Castle Gardens, Mario can collect some of the Star Bits. Shortly, the Castle Gardens are attacked by Bowser and his Airship fleet, causing some Toads to flee and others to be trapped in Crystals. Mario goes to the castle to rescue Princess Peach, but she is abducted by Bowser and Mario is blasted by Kamek to the Gateway Galaxy. Following this, the Castle Gardens are inaccessible for the remainder of the main storyline. After the world has been reformed, however, Mario, Bowser and Princess Peach, along with various other characters encountered during the game, awake in the Castle Gardens. The final level, the Grand Finale Galaxy, which is unlocked by collecting all 120 Power Stars as both Mario and Luigi, takes place in the Castle Gardens. In the level, Mario or Luigi can collect the 100 Purple Coins to make the final Power Star appear. ↑ シンのたわむれチャンネル. (May 22, 2016). 【実況】ポンコツ配管工　スーパーマリオギャラクシー　Part1. YouTube. Retrieved February 15, 2017. This page was last edited on March 22, 2019, at 07:56.